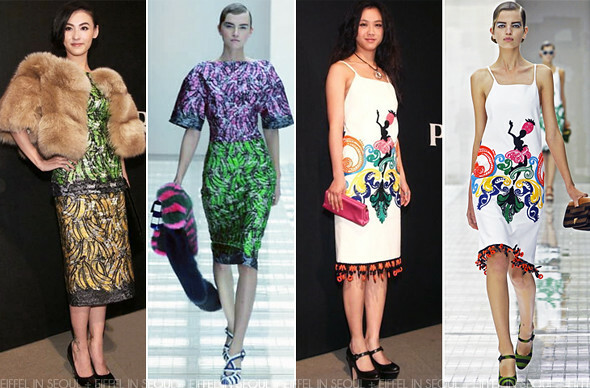 Prada held it's first runway show outside Europe on January 23, 2011 at Central Academy of Fine Arts Museum in Beijing. Models like Arizona Muse, Siri Tollerød, Sun Fei Fei walked the runway while big name stars like Gong Li (巩俐), Tang Wei (汤唯) and more were sitted in the front row. Cecilia Cheung (张柏芝) was my best dressed at the event, wearing a modified dress from Spring/Summer 2011. Her outfit was completed with a fur outerwear, black clutch and pumps. Tang Wei (汤唯) opted for white dress with baroque prints. I can't help but keep thinking it's a monkey print instead of a lady. Pink clutch and black platform mary janes to complete the look. 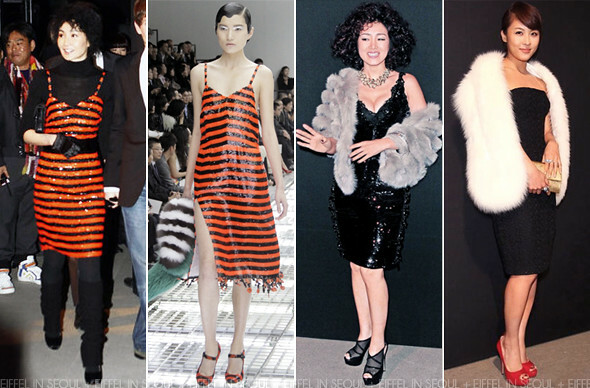 Maggie Cheung (张曼玉) wore a dress which was presented at the Beijing runway show. Styling it with a black turtleneck, gloves, tights+socks with a black satin pumps. I'm not a fan of this look. Gong Li (巩俐) outfit was disastrous from head-to-toe. Ha Ji Won (하지원) chose a simple black tube dresss with a white fur shrug, gold clutch and red pumps. A look which I did not expect at all. I wished she chose a dress which is more eye-catching. She was also seen carrying Prada's latest Spring/Summer 2011 handbag when she was leaving South Korea for Beijing at the airport. Although the handbag have yet to be photographed, it's on Prada's latest Spring/Summer 2011 ad campaign video which was recently released.